selling our book or audios. 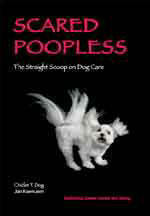 Thanks for your interest in wholesale prices for our book, Scared Poopless: The Straight Scoop on Dog Care, and for our new nutrition audio series: How NOT to Kill Your Dog or Cat. To help the guardians of dogs and cats feed their animals safely and help them achieve maximum health, Scared Poopless author Jan Rasmusen interviewed top pet food and pet nutrition expert Dr. Jean Hofve, former Editor-in-Chief of the American Holistic Veterinary Medical Association Journal and former AAFCO liason for The Animal Protection Institute. 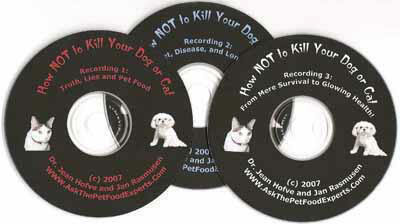 Learn more about these recordings at Dog Nutrition Recordings.